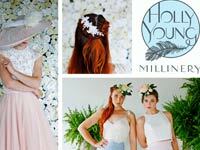 Holly Young Headwear is contemporary British millinery. Creating elegant and unique head pieces for women of all ages. Commission, buy or hire one of Holly's beautiful creations to suit your personality and your occasion. Get in touch to make a studio appointment to see what's on offer at Princes House, Truro. Manor Fashions is one of the few shops in the country selling exclusively special occasion wear for Mother of the Bride and Mother of the Groom. Stocking 17 different designers which includes Condici, John Charles and Veni Infantino, you can be assured of a personal and friendly service. Every outfit is coordinated with a hat disc or fascinator. Situated near Helston, ring Ann for your appointment.